A trio of friends at Stellenbosch University identified a challenge that many students face; during term time they had space in their hostels and residences to have some of their belongings and necessities. However, as soon as the University breaks for holidays, it was impractical to travel all the way home with these belongings. Michael-John Dippenaar, Michael Louis and Henri Bam all experienced the frustration of this logistical nightmare during their studies, and recount the stress of trying to find somewhere that is safe and cost-effective to store their belongings over the holiday period. Initially, Michael-John wanted to buy a warehouse, and rent out storage space, but when he really looked at the numbers, it was impossible to offer storage to students at prices that suited their budget. This model of paid storage is also restrictive in terms of accessibility and convenience. 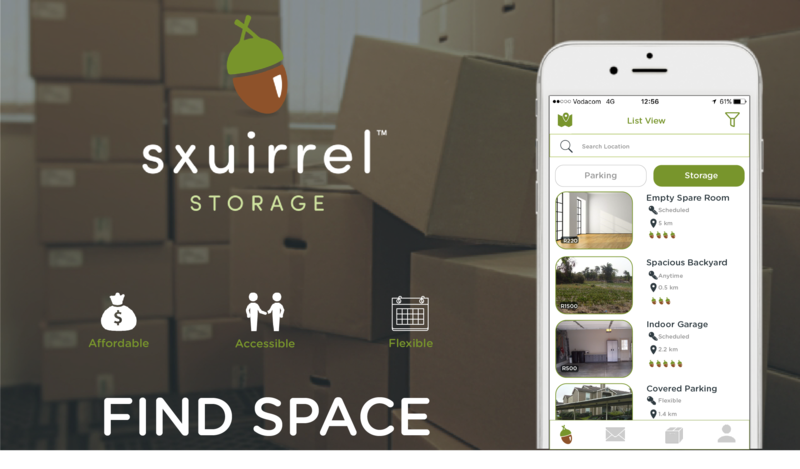 The three co-founders, or as they like to be known, the Scurry, came up with a solution to this problem, and Sxuirrel came into existence to operate as storage platform that is based on a similar principle as Airbnb. There are those who have space who would be willing to store things for a fee, and there are those who are willing to pay a moderate fee to have their items stored. Everybody wins. This service is a great example of the disruptive innovations that have taken the world by storm. When the Sxuirrel team presented their vision for addressing this natural demand they were one of the winners at the LaunchLab Ideas 2016 competition and subsequently earned a spot as an incubator startup company in the The Nedbank Stellenbosch University LaunchLab space. The Scurry say that the incubator programme has been invaluable for their companies development, the network is a huge asset, the positive energy and support has carried them through challenges and they could lean on other startups to help with problem-solving as essentially they are all in the same boat. They are looking forward to entering the Knowledge Acceleration Programme (KAP) and the Countdown Programme which assists startups in setting up the company, advising them on their equity agreements and introduces them to investors. These programmes also include business management and growth theory to help the startups get on to their feet. Of course there are challenges for any startup company, the Scurry said that keeping your momentum for your startup is vital to realising your goals, but this can be incredibly difficult as all three of them are also full-time students. -Studies and exams take preference, but time management and learning how to balance your interest became sink or swim skills for the Scurry. Further, they admit there are many moments where you have a crisis of confidence as a team, and worry about whether your service or method of delivery is novel enough to make its way into the market. Sxuirrel says now that they are days away from launching and looking back over their development, they feel that the LaunchLab definitely aided them in learning those skills. Now their focus is to earn traction in the local market starting with targeting students and then scaling up to the whole of the South African market. They have exciting plans to expand their services to a whole range of SPACE solutions including storage, parking,office and work space. Who knows, next year this time Sxuirrel may be a household name, like Uber and Airbnb. Innovus, the university-industry interaction and innovation company of Stellenbosch University, wish them all the very best of luck in their endeavour!